Stacked with layers of smoked turkey breast, cheese, lettuce, bacon and tomatoes, these triple-decked tortilla wedges make a tasty dish for two. Top 1 tortilla with 4 turkey slices, Singles, second tortilla, lettuce and bacon. Cover with third tortilla, remaining turkey, tomatoes and remaining tortilla, mayo-side down. Cut into wedges. Serve with 1/2 cup baby carrots and a glass of fat-free milk. 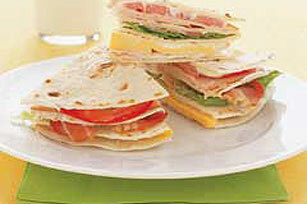 This tasty summer sandwich stack can be made ahead. Assemble on a sheet of heavy-duty foil; wrap tightly and refrigerate until ready to serve.